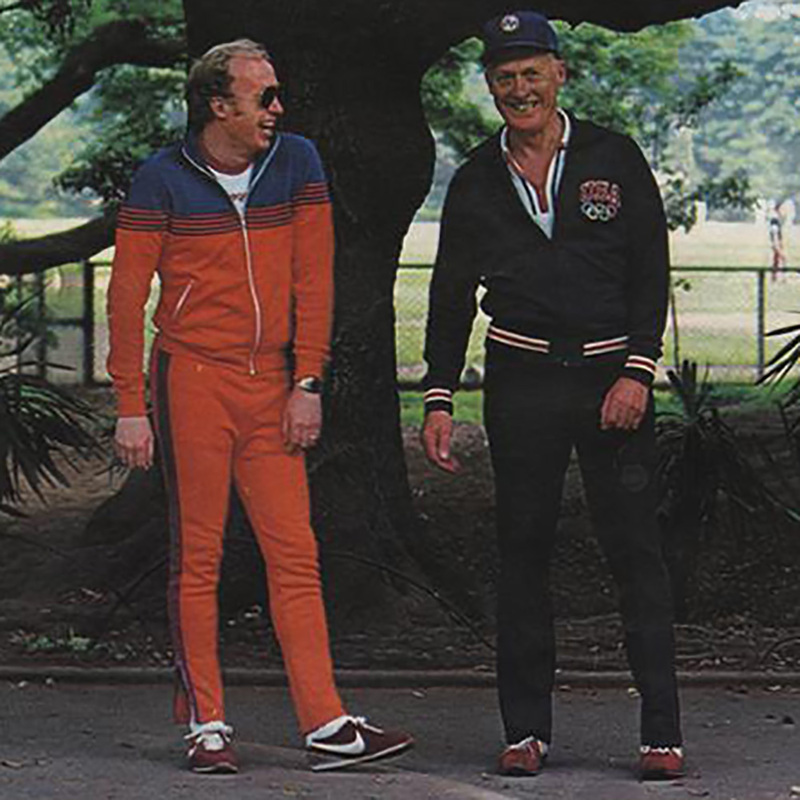 If you’ve read “Shoe Dog”, you know that Penny and Phil Knight lived modestly while white-knuckling it through many lean years before Nike went public and morphed into the swoosh worn around the world. Even so, as soon as they were able, they began giving back to the UO in a big way. The sporting world knows about the gifts that helped propel Phil’s beloved Ducks out of obscurity—from expanding Autzen Stadium to new facilities that are the envy of Division I schools everywhere. 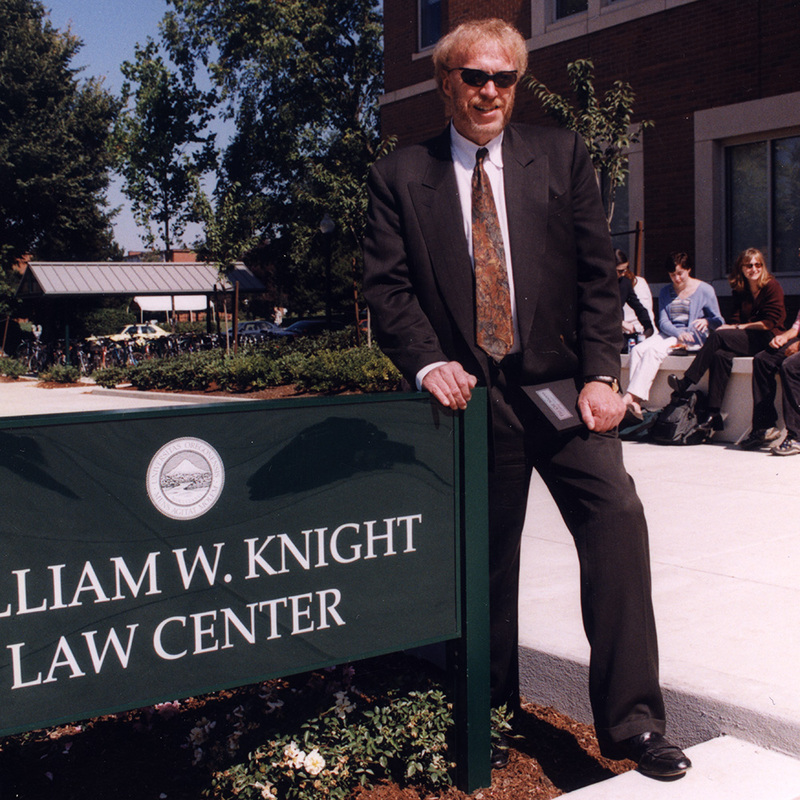 But in 2016 the Knights’ less well-known legacy of support for UO academics took center stage with their extraordinary $500 million gift to launch the Phil and Penny Knight Campus for Accelerating Scientific Impact. Their vision already has initiated a seismic shift, dramatically expanding the UO’s science and research footprint. Fueled by ingenuity and funded almost entirely by philanthropy, the Knight Campus promises to create new opportunities for students, attract highest caliber faculty members and scientists, spur partnerships and economic breakthroughs for the state, and, perhaps of greatest importance, yield significant benefits for society. 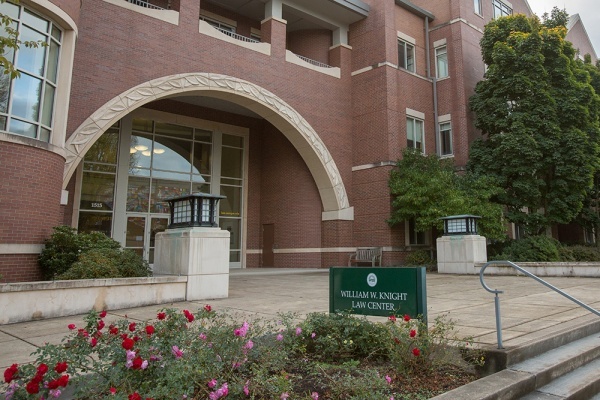 The Knight Campus builds on the family’s foundational role as major benefactors to the UO’s academic mission. Following their first major gift for the renovation of Hayward Field in 1990, the Knights focused on strengthening the UO’s teaching and research mission. In 1994, they made the lead gift for the most pressing need on campus at that time: the massive expansion and overhaul of the main library, which could not have gone forward without their support. 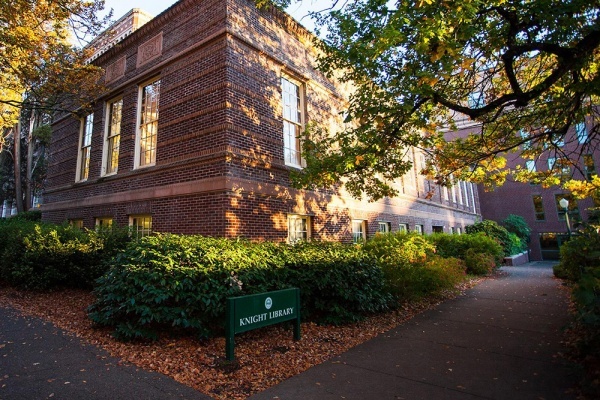 The following year, they funded more than 30 Philip H. Knight professorships and chairs, a masterstroke designed to fight off deep-pocketed schools that routinely raided the UO’s rising stars. At the same time, they also made the lead gift to build a proper home for the state’s only public law school. Through these and other gifts, the Knights reached out to steady and strengthen the UO’s academic side during its darkest hours. It seems unthinkable now, but cutbacks in state funding during the 1980s had forced the closure of several nationally acclaimed academic programs, driving outstanding professors away from our state and threatening the UO’s membership in the elite Association of American Universities (AAU). Many other gifts for academics flew under the radar, low-key or even anonymous. Sometimes you find clues. Scholarships named for family and friends. Two seats with tiny brass plaques, side by side, in the venerable Robinson Theatre, renovated in 2004 as part of the ambitious James F. Miller Theatre Complex. If you squint, you can make out “Phil Knight” on one and “Penny Knight” on the other. Bold and effective, the Knights’ giving inspired more than 100,000 alumni and friends to power three record-setting fundraising campaigns (including the current one). Led by Phil and Penny, they helped the UO faculty achieve the longstanding goal to gain Carnegie “Tier One” status, which is accorded only to research institutions designated as having “highest research activity,” in 2010. For all time to come, Phil and Penny’s visionary philanthropy, motivated by a fierce loyalty to their home state, will continue to enrich the lives of every UO student while benefitting their fellow Oregonians and contributing to the greater good. Previous to the soon-to-be built Knight Campus, the magnificent buildings made possible by Phil and Penny are named for people they hold dear: their mothers (Hatfield-Dowlin Complex) his father (William W. Knight Law Center), the extended family (Knight Library), a memorial for their son (Matthew Knight Arena), a cherished friend and adviser (John E. Jaqua Academic Center for Student Athletes), and a role model for the ages (Marcus Mariota Sports Performance Center). And now, with the vision for Hayward Field—a training, research, and competition venue that will be second to none—the circle that began with a skinny undergrad’s laps around the Hayward Field oval will be complete. 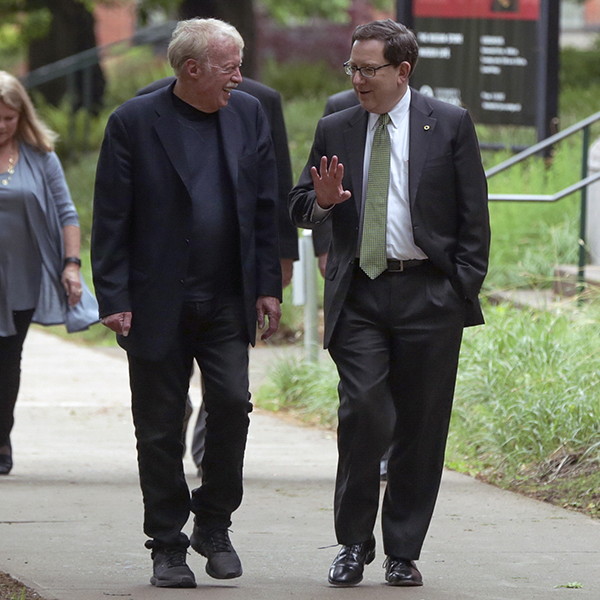 Phil Knight humbly said that he was Bill Bowerman’s guinea pig. But that only hints at the complexity of their relationship. Nike cofounder Bowerman was Knight’s coach, teacher, mentor, business partner, and teammate in a never-ending pursuit of excellence. The new stadium will be a fitting tribute. 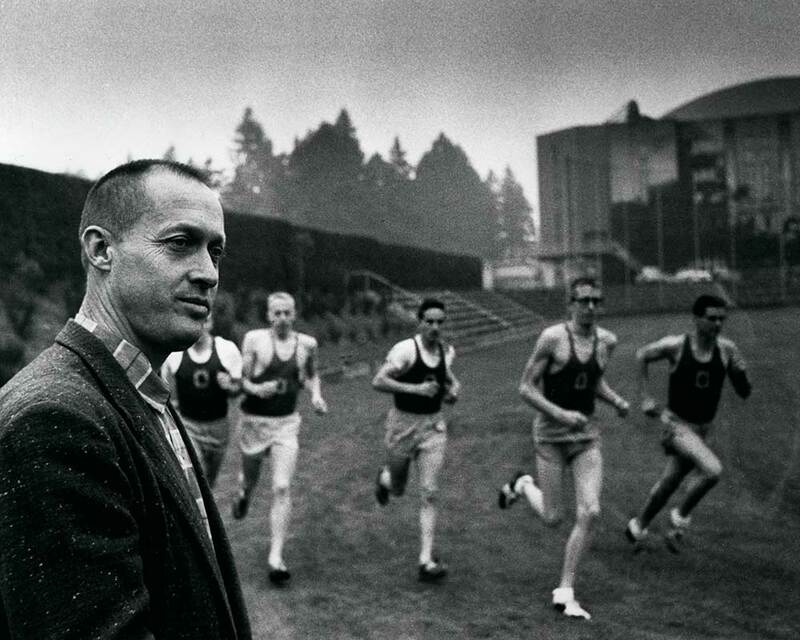 Legendary University of Oregon track coach Bill Bowerman watching as five distance runners, including Phil Knight (second from left), enter a turn on the practice track near Hayward Field in 1959. 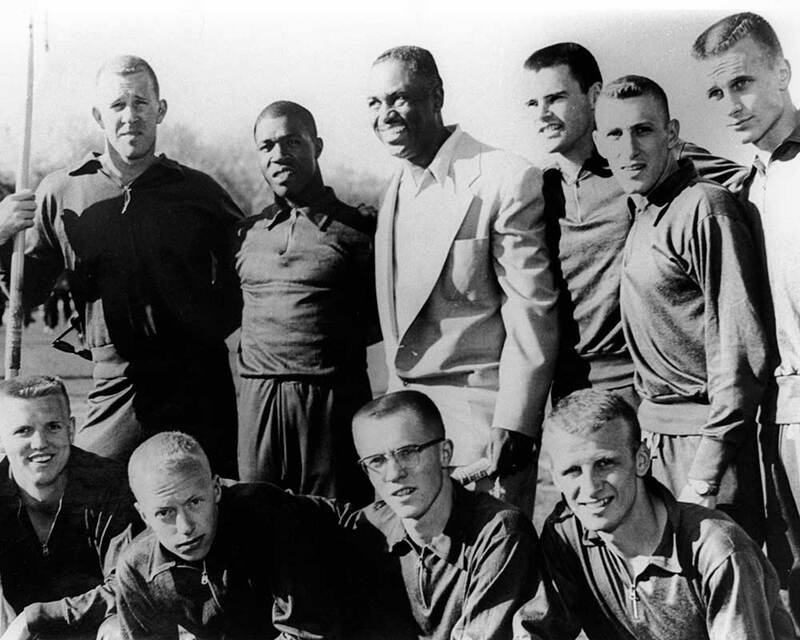 Former University of Oregon sprinter and Olympian Mack Robinson with nine members of the 1959 Duck track and field team, including Phil Knight (front row, second from left), at Hayward Field.